Nodding Head Games is a console developer based in India, with a talented team that has experience with companies like Rockstar, Ubisoft, EA and Zynga. It's aiming to be one of the first studios out of India to release a high profile game on consoles, and to do so with a tale rooted in ancient Indian history. Raji: An Ancient Epic is a project with some well known supporters, and is currently seeking support via a Kickstarter campaign; if successful the game would come to the Switch (and other systems) in 2019. The game has a mix of mythology and architecture from India, as well as popular gameplay elements such as environmental puzzles and close combat. It's already been in development for some time, with the studio's employees self-funding up to this point; it looks rather impressive. To learn more we caught up with Nodding Heads Games Founder and Game Designer, Avichal Singh. First of all, congratulations on the launch of your Kickstarter. When did the studio start? The idea of setting up shop was conceived a couple of years ago, we would most likely call this a dream. However, this became a reality on the 10th of January, 2017. 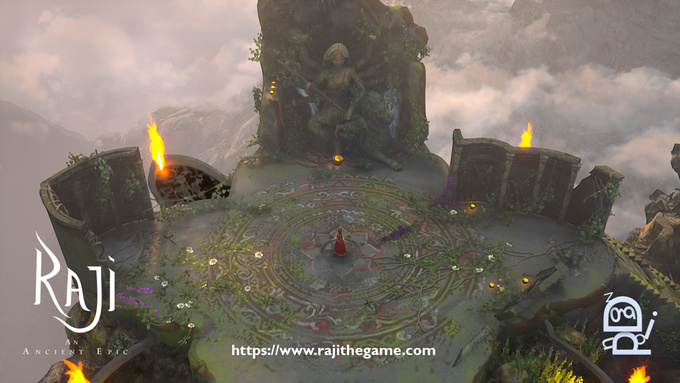 The founders Shruti, Avichal and Ian had gone over several hours of conversation and iterations before coming up with their first title for the studio, “Raji: An Ancient Epic”. A game which would represent lore, myths and culture from India, allowing you to play as Raji, a young tribal girl blessed by the gods... Her destiny, to rescue her brother from the clutches of the demon lord Mahabalasura whilst bringing an end to his regime and saving humanity from the demonic onslaught. What's the reception been like regarding the demo and from Kickstarter so far? We’ve received an overwhelming response to our Kickstarter demo, many YouTubers and those who are genuinely interested in something fresh and new have been doing live streams. And what’s fascinating is being able to see how others tackle the different scenarios along with their prefered tactics. We were at both the Nasscom Game Developer Conference and Indian Gaming Expo earlier this month where we had a modest booth showcasing Raji. We were inundated and rushed off our feet both days of the conference owing to the crowd's reaction towards Raji. Many were queuing to play the game and everyone we spoke to fell in love with the artstyle and was hooked on the setting/backstory of our game. Our aim is to provide a fresh and unique universe, and it’s great to see our audience being drawn to the same. We’ve had lots of constructive feedback regarding the combat and the controls, which we will be definitely incorporating post-Kickstarter when we start full production on the game. Our reception on Kickstarter has been positive, we’ve received loads of encouraging feedback as well as constructive comments. We’ve re-worked our Kickstarter page couple of times to highlight and clarify some of the content after receiving feedback. And we’re currently over a third of the way to our goal with 9 days to go. While this is fantastic we undoubtedly need our audience to reach out to one and all, casting the net further. As of now, the deadline is achievable and we’re working very hard behind the scenes to reach out to as wide an audience as we can to spread the word. Where did the idea to make a game come from? The idea to make “Raji: An Ancient Epic” came from a vacation trip to Jaisalmer, Rajasthan, back in 2014. The architecture from the medieval era in this small town captivated us and inspired us to make a game that can represent India. What is the main focus of Raji's gameplay? The focus of Raji’s gameplay is on fluid and gritty combat, enticing environmental puzzles and an emotional story which unfolds itself as Raji overcomes several hardships whilst finding her younger brother. A few elements which will stand out in the game are as following. Use of Indian themed weapons, these weapons function differently to their western counterparts, while the Chakra will be a high skill based throwing disc, Sword and Shield will act out as a “dance form”. Whereas the Gada (Indian mace) will displace enemies when meeting them. Favor of the Gods allows Raji to seek blessings of the Gods who grant her several elemental powers like ice, fire, lightning, rage, etc. These abilities combined with the weapons allow Raji to switch between different gameplay styles, allowing for diversity. Mandala puzzles are aesthetically appealing yet sometime challenging, these give the player a pause for thought. We have planned three types of Mandala puzzle, the first one involves hand drawn symmetric patterns which look complex yet fascinating, the second being asymmetric mandalas which tell a short story from the universe of Raji while the third are the most magnificent of all, allowing the player to arrange the environment piece by piece. These puzzles will be used to provide a memorable experience to the player. Sibling Storytelling, Raji: An Ancient Epic will also follow the story of siblings. A sister looking out for her younger brother, amidst the chaos and turn of drastic events. We are planning a dedicated level and mechanics which will allow us to focus on the emotional bond of Raji and Golu, not through just cinematics but also through actual gameplay. We feel our story will allow for a gripping experience along with the combat and the puzzle elements we’re providing in the game. How important is it to represent Indian culture in Raji? What gaming genres or franchises are popular in India? Genres like MOBA, FPS, Third Person Shooters and Action Adventure and franchises like Counter Strike, DOTA, LOL, COD, Battlefield, Assassin's Creed, Tomb Raider, Uncharted, FIFA, Cricket are popular in India. What games or elements from popular culture have influenced Raji? To speak of games that have influenced Raji, being gamers from ourselves, who knows what we’ve added to the game subconsciously!? The emotions inspired from Ico, Shadow of Colossus, Brothers: A Tale of Two Sons, a hint of gritty combat from Dark Souls, Bloodborne, fluidity of combat from Devil May Cry, Bastion, God of War, the aesthetic feeling from Journey, Transistor... And when you sit down and say, well, we liked this from that and that from this, you soon start realising that you’re going to need a larger canvas… one that’s ever expanding. Ultimately we have been influenced by other games and genres, and yet we’re implementing a lot which we feel has not yet been seen or done in Raji. When was the decision made to bring the game to Switch? There were two points when we knew that the game has to come to Switch, at first when Unreal Engine 4 announced the engine will be able to supported on Switch. At this point we were still focusing our demo build on PC but this news meant that porting to Switch was now easier than ever. Fast forward to September 2017, our game went live on Square Enix Collective platform to collect feedback from the community there. Our trailer was uploaded by a YouTuber called Dante Nintendo Switch World on his channel. The trailer on his channel unexpectedly went a touch viral and we received way too many comments asking if the game will be released on Switch or not. We had planned Switch to be a stretch goal, but looking at the response ever since the Square Enix Collective trailer we decided that the game must come to Nintendo Switch, as there is definitely a community waiting for the game. What was your interest or exposure to the rumors of the NX / Switch? When we heard of Nintendo Switch we were intrigued to know how would it perform in a already dense market where PS4 and Xbox have occupied most households. Though when the Switch was revealed and it banked on the ease and convenience of playing your game seamlessly, we were very impressed. We are glad that it has gone out to make its own market. How hard has it been to buy a Switch in India? While Switch is available online, it is costlier than the default price that goes by in UK or US. We haven’t seen the console in any of the major electronic shops or malls either, hence it is not accessible option. Nintendo historically has been slow to bring the 3DS and Wii U to the Indian market - how has that affected your decision to bring it to Switch? It is true that Nintendo has been historically slow to introduce its consoles to India, the same goes for Switch. However this has not affected the team’s decision to bring the game to Switch, as were always aiming for an International audience. The team grew up on Mario, Zelda, Donkey Kong, Contra, Pac Man, Ice Climber, Excitebike, Lode Runner, Duck Hunt, Bomberman, Kung Fu Master, Mario Kart and probably a few more that we’re not able to recall at this moment! We'd like to thank Avichal Singh for their time. You can check out the Kickstarter campaign for Raji: An Ancient Epic right here. Love the art style and the music. Gameplay looks a lot like Diablo, which I love. I hope their Kickstarter goes well because I'm already looking forward to this game. Looks cool! I know it's still early but I hope to see more variation in the combat and monsters. I am all about that on premise alone. Very beautiful. Definitely looks like something that I'd be interested in playing. looking forward to the ost! @derty We had a recent game like that with Uncharted the lost legacy, tho. Now it's interesting that they'll bring it to Switch despite said platform being hard to get in India. Indian Diablo sounds like fun to me. I’m really looking forward to this game. I just literally fell in love the moment I watched the first trailer a few months back. It won't happen without backing, people. Pledge some $! I'm not usually one to fund kickstarters for games, but this one does look intriguing. I'll have to look into it some more and consider it. A very historically accurate ancient India, they forgot to say. Wow. Let's hope it goes good then, this game has a lot to offer! Oh my goodness, this hurts so much. I've been dying for a game just like this. Genuine Indian culture and architecture plus fun combat. And added to it is excellent animation. But I really only want it on my Switch and approx. $35 to get it on Switch is too much right now. I'm so sad! Maybe I'll just pledge for the Steam key and pray that Rainway becomes official on Switch. I saw this a couple of weeks ago. It looks pretty strong. Looks great but they got no chance of reaching the stretch goal for switch , hopefully they find some other way of getting the cash to fund development. Sadly, this didn't make it. They only got to about half of the 120,000 pounds sterling needed by the deadline. The game is beautiful and so is the music. I'm hoping they'll make another try or get the backing of a publisher with deep pockets. There aren't many games coming from non-traditional markets, but there should be. Bummer!